The first summer rains have arrived. This means that the bush has taken in a breath of new energy and is changing colours day by day. I can never decide what my favourite season is in the bush but I must say… when we arrived at Nkombe Camp early September, I was blown away! The earth had been craving water for so long and finally the thirst has been quenched. My senses were more awake than ever… the smell of fresh vegetation and wet soil – an earthy scent that cannot be bottled or replicated. I absolutely love the sounds of buzzing insects calling incessantly at dusk and the characteristic calls of many male frogs in the hopes of attracting females. The bush is alive and it’s just getting better! This blog is, however, not dedicated to the wonders of the ever changing bushveld. It is dedicated to our first Correspondence Course practical of 2015! Students from all corners of the earth came together for two spectacular weeks with one thing in common – an everlasting passion for nature! The students arrived on the 19th of September and we wasted no time in getting them into the swing of things. The next thing on the agenda for the first day was 'welcoming sundowners'. We unfortunately didn’t see the sun go down as the weather was not ideal and continued to drizzle for a day or so. That being said, we were so impressed with the students, as they never once let the weather get the best of them. 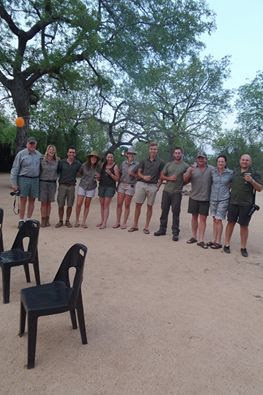 We had an amazing sundowner stop under an impressive Jackalberry tree and enjoyed Mandla’s homely chicken potjie around the captivating fire whilst getting to know each other. The first few days were spent learning about trees and birds. Dave Strydom (our expert birds and trees lecturer) truly has an impeccable way to give students the tools to gain the skills of successfully identifying trees and birds. We enjoyed bush walks every morning, as one tends to learn more whilst on foot. There is more to see, smell and hear without the noise and distractions of a vehicle. The one thing I was not so keen about was all the pepper ticks! I walked through at least three nests and I sit here now itching and itching with over thirty bites (yes, I counted)! It seems they have grown immune to Tabard. Nevertheless, it was completely worth it! One day stood out in particular: the 25th of September. We went for a long game drive to the south of the reserve and had two absolutely stunning sightings. The first was of a pride of lions on a buffalo kill. This was the Southern Pride – experts in eating buffalo. We also enjoyed seeing a massive dead tree covered in various species of vultures waiting for their turn to devour the leftovers. What an unforgettable scene! This was also the first ever sighting of lions for one of our students! The other magnificent sighting was of a herd of elephant - our favourite animals of all. It started as we saw a bull elephant on a mission. He covered a lot of distance in a very short time. After following the determined elephant, we came across a breeding herd. The bull was in hot pursuit of the females, but they were showing no interest. I predict the bull was too young and not in musth. After failing to impress the females, he moved off. It was that perfect time of day just before the sun started to set. We parked our vehicle some distance from the herd and let them approach us. It was incredible. The females passed right by us, carrying on with their usual activities. One relaxed female even fed on a tree less than five metres away from Joe (a student from England). He claims this to be one of the best moments of his life. A young calf was gently guided by her mother - stunning to watch. My best sighting of the week! This day also happened to be my birthday. I couldn’t have been happier spending it in the bush with this amazing group of people. The students even made me a special gift – they carved onto a piece of wood and all wrote a special message on it. Thanks again guys! Before we knew it, it was assessment time! We treated our students to a surprise bush breakfast with an amazing view of a dry riverbed and the open plains beyond it. This was also our way of saying 'good luck!' to everyone for the upcoming days. We are so proud of each and every one, as they all passed their assessments with flying colours as well as their FGASA 1 exams. Congratulations ANTs! We haven’t even spoken about half of our fantastic sightings…We were treated to a visit by wild dogs which spent the day less than five hundred metres from camp! They are always fantastic to see and we loved the fact that they were so close to us for so long. The majority of the time spent at Nkombe Camp was focused on the smaller aspects of nature which are no less important than the famous Big Five. The rest came naturally, as we saw all of the Big Five on the last day without even trying. We saw female lions on another buffalo kill, as well as a gorgeous female leopard which recently had hunted a duiker. We were privileged enough to see a massive herd of buffalo, after which we stopped at a famous granite outcrop to have some refreshments overlooking the reserve. What a day it was! After this course, we can all agree that we will never look at the bush the same way and we have a much better insight into the never-ending world of nature. What a great group of people!